Domus of the Birds (Italica), at Santiponce, Seville. It has the usual organization for a Roman domus: a porticated peristylum surrounded by the other rooms. It is a house for high class, it probably belonged to an aristocratic family from the city. It must be pointed out that this kind of houses represents just a minor part of population. Houses for ordinary people were clearly worse. Slaves "guetos" were close to misery. It is endowed with a good quantity of mosaics of a high quality. One of them gave its name to the house. 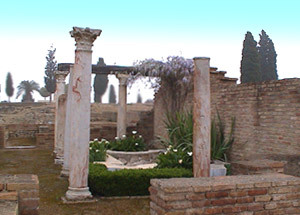 It is the first house totally excavated from the whole of Italica. Today it is restored and rebuilt with little walls of 60 cm. high to limit different rooms. 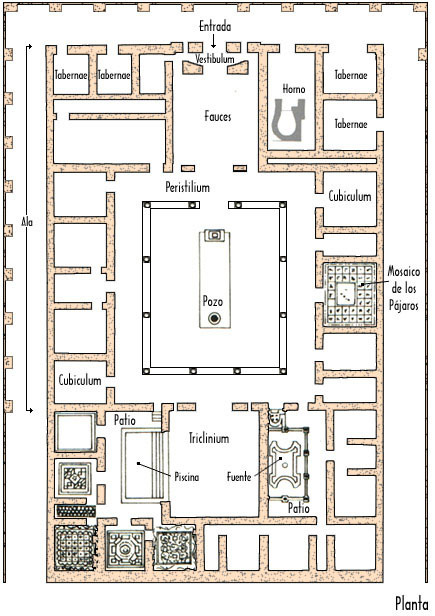 From the door, visitors find a hall -vestibulum- that immediately communicates with the "fauces": an entry to the "peristylum" or porticated patio with a well: the distributional center of the house. It is composed by a covered wall with a rectangular plan surrounding the patio. Doors of rooms are open to it. For supporting the cover, many columns would be used. At the bottom there is a "triclinium", surrounded by two open patios -exedra- with both fountains and other with a swimming-pool. At this area, there were also other main rooms: all of them are paved with very rich mosaics. At both sides of the house there are rooms for servants, kitchens and gutters. 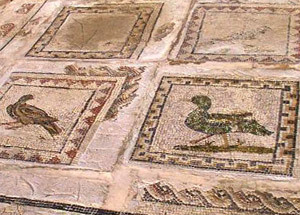 Left side of the house includes a paved cubiculum with a mosaic with birds that gives the house its name. Finally, at the main façade, there are rooms open to the exterior: one of them has a furnace, but there were shops -tabernae- associated to the house. Detail of the mosaic that names the house.